This human resources handbook for the solo practitioner gives you the guidance and tools to run your HR department effectively and efficiently. Whether you're a person new to HR or an HR manager in a solo environment, it will help you perform your HR function with the best of the them. 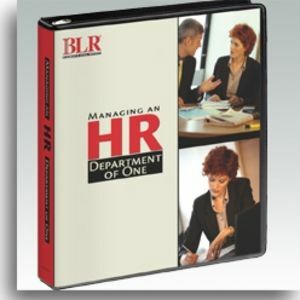 Managing an HR Department of One explains how to align HR with your company's goals, build credibility and influence, understand HR ethics, cope with management expectations, learn effective staffing strategies, and use HR metrics to prove your contributions. Practical chapters show you how to get big HR performance with a limited staff, align HR's goals with the company objectives, how to find out what your CEO really wants, and keep your efforts focused. This book also covers keys to building credibility and influence Learn how to engage other managers and get their support, plus ethics for the HR professional. There is an overview of compliance, federal and state issues, and best practices. At-a-Glance reference summarizes all key laws you must comply with such as posting requirements, staffing, hiring and firing, the legal side of compensation and benefits, privacy concerns, and harassment. The strategic HR planning process gives you practical guidance and tools for HR communications, handbooks, budgeting and resource allocation, recordkeeping, recruiting, hiring and interviewing, and more. Training for organizational excellence provides you nine steps to effective training, training preparation, topics for training, documentation, evaluating effectiveness. Managing an HR Department of One also includes prewritten forms, policies, and HR checklists as well as carefully developed templates that save you time and money. Gives you practical guidance and tools for HR communications, handbooks, budgeting and resource allocation, recordkeeping, recruiting, hiring and interviewing, etc. Very high-level, generic overview. I purchased it assuming it would help me make sure I wasn't missing any relevant HR points in my new position as head of the department. While it states it is for people either new to HR, or for those where all the HR responsibilities fall upon their shoulders, it really is just a very basic outline of main points. Would be good for someone just getting into HR, or who has been a specialist in only one or two disciplines inside HR, and need a broader view of all HR aspects.